Skirt, dome, feet and skin work! 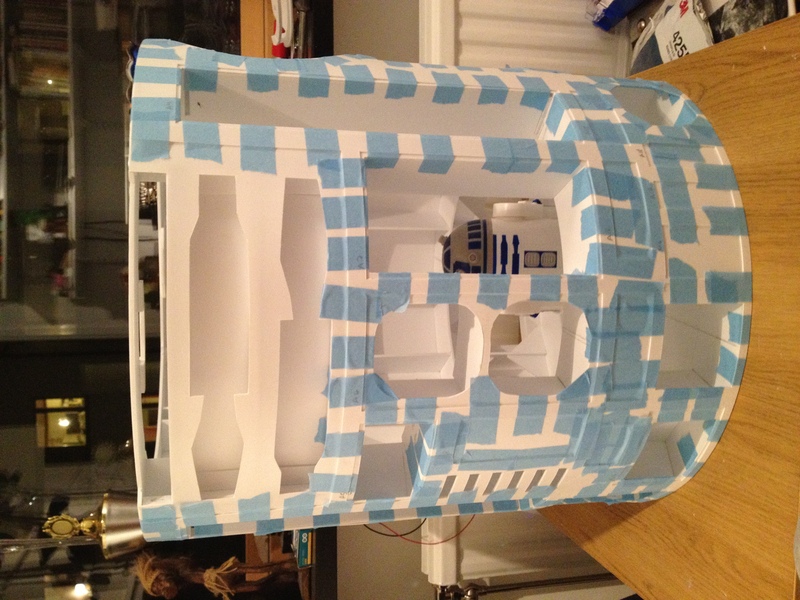 Home/Building/R2-D2/Skirt, dome, feet and skin work! A lot of time over the weekend has been spent with just going over fine details. Sanding, tweaking, that sort of thing. I did start proper work on the skirt two days ago, but nothing to really show for it, but as of now, I guess it is about halfway done. I’m going to add inner walls to the skirt, to make it look nicer, even though it is only for myself… This piece needs a good sanding before I continue working on it. So, I had this idea of how I should attach the bolts that holds my main feet in place, and since I use foot shells that are hard to get off, and also slightly difficult to reach into, I decided to use T-nuts on one side, thus leaving plenty of room on the battery box side, and that being the only place I need to do anything on when attaching the feet! Since the feet is such an important area, I really did not want to do something that would weaken them, but I still have 9mm of styrene on each side of the foot “trench”, so I think I should be good =) Can’t wait to try them out for real! I just had to try … get a feel for what they will look like! horseshoes is the next area where I will start constructing after my skirt is done… I think… unless I actually make the second foot shell first. 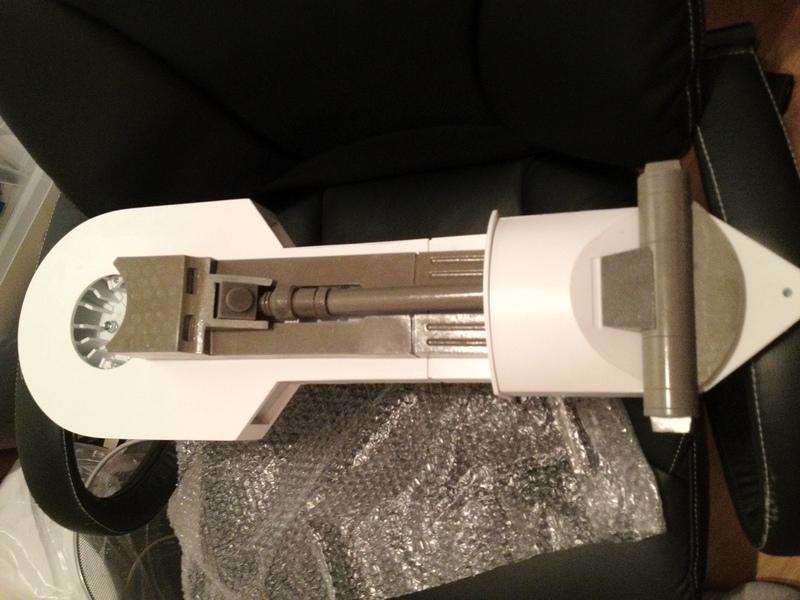 This will look so much better once I get the aluminium leg strut, that should arrive in a few days! 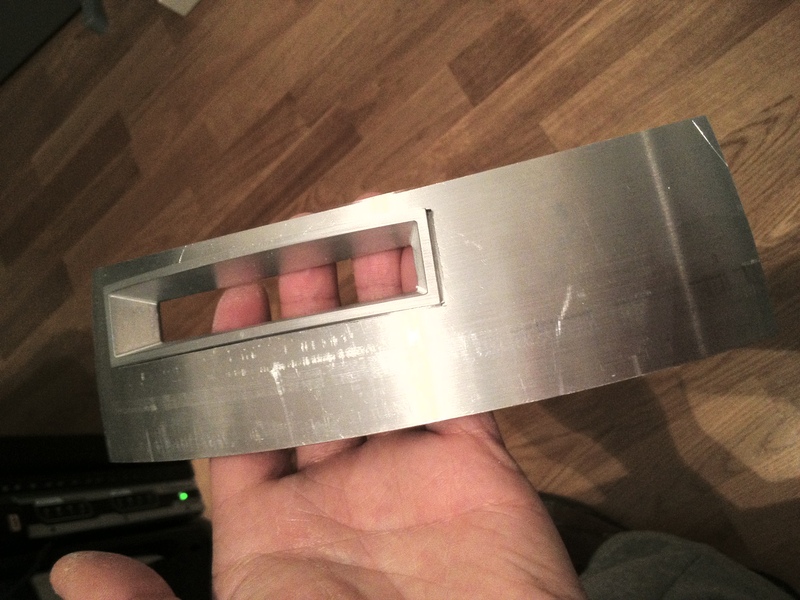 I’m also thinking about having someone make me an aluminum version of the plate that the booster covers and leg struts rests upon. Anyway, Since I had skinned my ankle all around, the resin tube that goes across the ankle is slightly too small, and I either need to scratch build one (easy) or dremel it up a bit. I’m leaning towards scratch building! 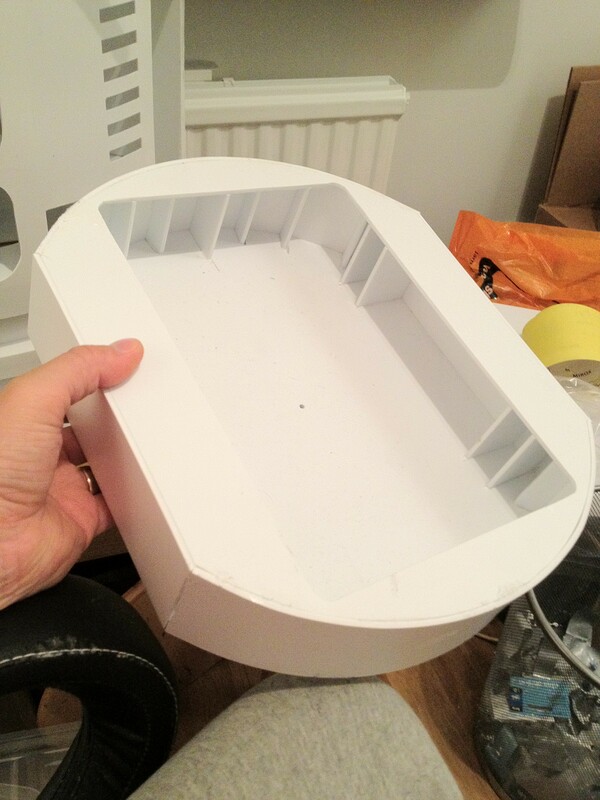 The outer front skin is now glued in place, and should hopefully be taped well enough over night to fasten securely. I’ve already identified several areas where I will need to cut out more from the skin after they have set, but It’ll be fine, I’m sure. 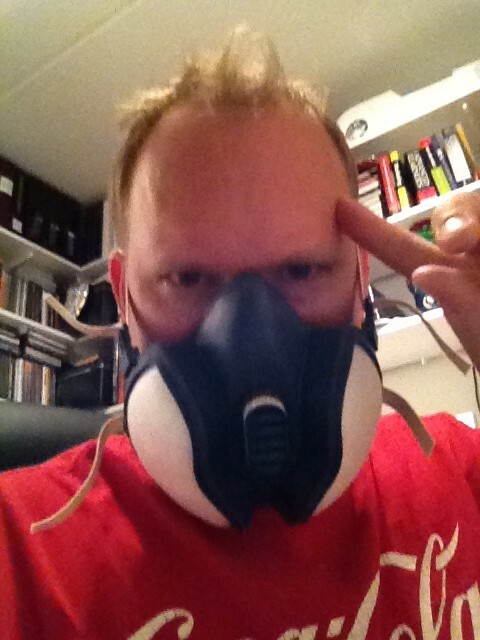 Me in “glue mode” .. Don’t want to get too much of them fumes… gives me a headache! 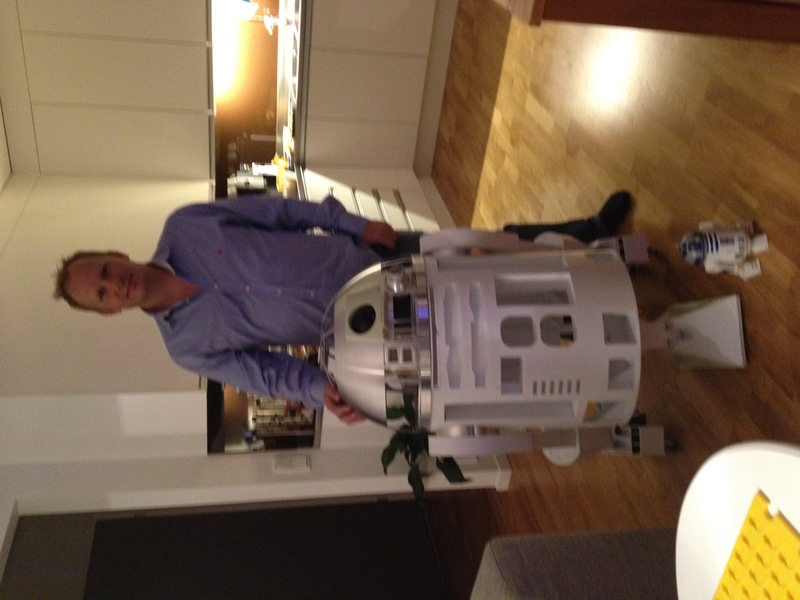 By micke|2016-12-06T00:01:54+00:00February 19th, 2012|R2-D2|Comments Off on Skirt, dome, feet and skin work!